SEOUL, Oct. 9 (Yonhap) — South Korea marked the anniversary of the promulgation of Hangeul more than five centuries ago Monday with various events highlighting the history and value of the Korean alphabet. Considered one of the simplest and most logical language writing systems in the world, Hangeul was invented by King Sejong of the Joseon Dynasty (1392-1910) in 1443 and promulgated three years later to replace an older writing system based on the Chinese script. 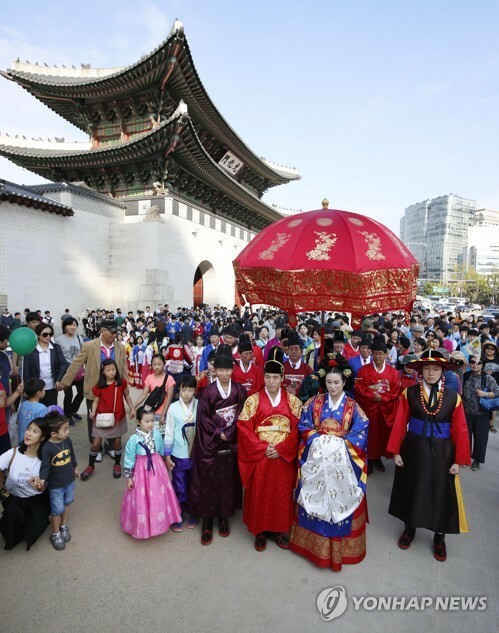 The main event to celebrate the 571st anniversary of Hangeul was the Grand Hangeul Cultural Festival hosted by the Ministry of Culture, Sports and Tourism at Gwanghwamun Square in central Seoul. The festival consisted of various programs such as exhibits, dance, music, children’s play performances, hands-on experiences, symposiums and a Hangeul writing contest. A special exhibition titled “100 Years of Korean Fairy Tales in Hangeul” is under way at the National Hangeul Museum in Seoul to celebrate the anniversary. The exhibition opened Aug. 8 and is scheduled to run till Feb. 18 next year. The museum also had various cultural events for children and their parents such as a book flea market, exhibits, performances and hands-on experiences Sunday and Monday. The King Sejong Institutes, state-run Korean language education centers abroad, hosted a contest of Hangeul calligraphy for foreigners in celebration of the national holiday. Hangeul Day was initiated in 1926 by a group of Korean-language scholars as part of its efforts to preserve the written language under Japanese colonial rule, during which Japan banned its use and implemented Japanese as Korea’s official language. The day was designated an official holiday in 1949, four years after Korea was liberated from Japanese rule but was excluded from the list of public holidays in 1991 on the grounds that too many holidays would adversely affect the national economy. The government re-designated the day a national holiday in 2013 with the rise of public attention toward the historical and international value of Hangeul.